I used a small baking pan rather than the muffin-tin for these. Normally I use a mini-loaf muffin type pan to shape my bacon wrapped chicken thighs (aka cupcake chicken). However, that pan was at the other kitchen so I had to adapt a bit. We had 4 thighs so I deboned them and wrapped them in bacon. (Boars Head uncured) The 4 fit nicely into this square pan and I gave them a little olive oil in the bottom, a good shake of Angry Man Rib Rub and generous cap of butter. 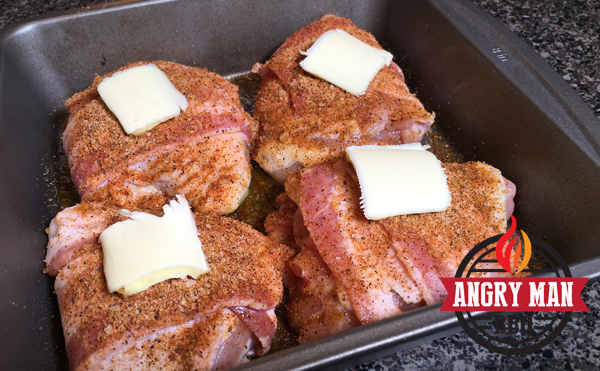 Rib Rub, Bacon & Butter – these thighs couldn’t help but be tasty!!! The thighs went into the BGE set indirect at 350° for about and hour. They were really well done at that point so I pulled the pan and covered it to let them rest a bit. 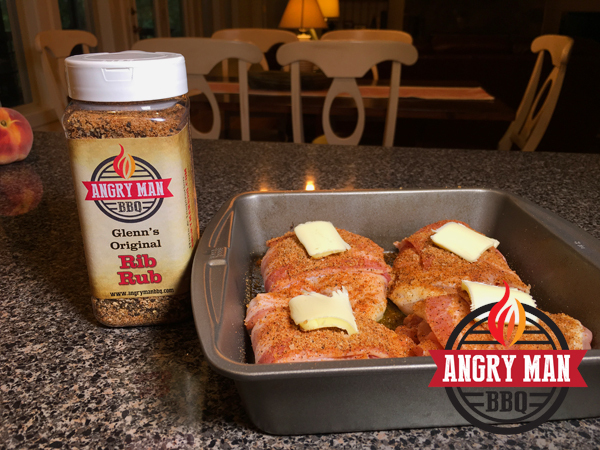 I gave them a quick brush of my White Wine BBQ Sauce and then let them go back directly on the grill just long enough for the sauce to set and the bacon to dry a little. But the main event for the evening was the Mac-Cheese. It’s been a long time since I’ve made this. I had to give up a lot of cheeses (and other good stuff) for a doctor “suggested” diet and it hasn’t always been fun. The few cheeses I can have are traditionally white like White American. So this batch was made with mostly White American and a little bit of a Raw Milk White Cheddar for a bit deeper cheese flavor. I’d been inspired/challenged by Kevin Ward (Four41 South BBQ) earlier this week when I helped at BGE Culinary with a class he was teaching. He’d made a killer pan of mac-cheese that really threw a craving on me so I was cruising toward a serious cheese encounter. 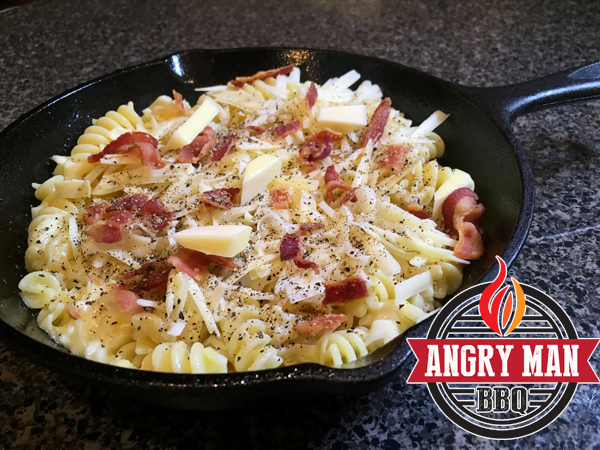 Fusilli Pasta, White American Cheese, White Cheddar Cheese, Heavy Cream, Butter, Pepper and Bacon – hummmm, hat sounds good! No recipe – I just took the inspiration and tossed ingredients together. We cooked up a small amount of fusilli pasta (fancy name for corkscrew pasta) and while it was warm added the grated cheeses, butter, heavy cream, pepper and gave them a good stir. All this was tossed into a small cast-iron pan and topped with bacon crumbles. This spent about 25 minutes in the 350° indirect BGE. About the time the mac-cheese started to brown was when I tossed the thighs back on the grill. After about 25 minutes on the BGE this was a pan of creamy goodness. The Pleasant Lady had roasted some fresh broccoli to round out our plates and we were set. Gotta tell ya’ that this easy meal was something special. 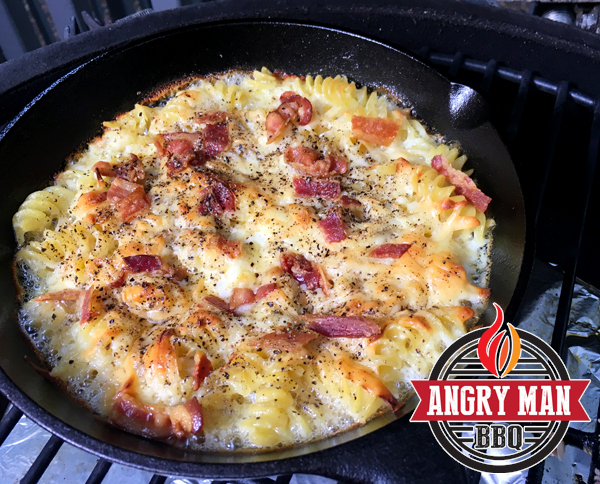 The thighs were moist, tender and super flavorful and the mac-cheese was – well, I had to just back away from the pan or I would have just finished off the whole thing. The broccoli had been tossed with just a bit of herb infused olive oil before roasting and was perfection. Our simple meal was pretty much fine dining by the lake side. 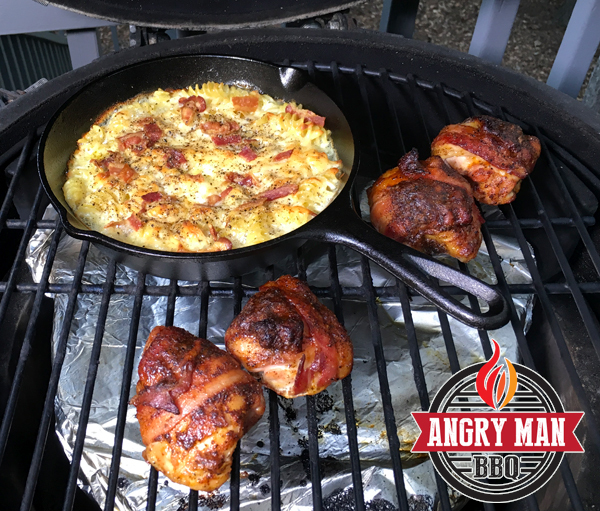 We were ready to eat so no pretty plate pics…..
Mac Cheese and Chicken Thighs ready to serve. Hope you experiment some – take an idea as inspiration and just start mixing. Sure, there will be times you’ll wind up angry but that’s a proverbial “learning experience” that will bake you a better cook the next time you put on an apron. This one turned out great for us – and there are leftovers!!! 4 Responses to "A Mac-Cheese Challenge"
Looks great!! The combo is a perfect match! Btw, it’s Rotini. Fusilli is also corkscrew but spaghetti length and thinner. Both the chicken thighs and the mac & cheese look delicious. I hadn’t thought of cooking the thighs in a muffin tin. Great post! Trying to get back into reading my favorite blogs. It’s been great to make mac & cheese with the White American! We’ve used both round and rectangle pans for the thighs for a different look. Thanks for reading!! !